Harry Anderson aged 74 died recently in Portsmouth following a long illness. He was a regular visitor to the Maybole site. 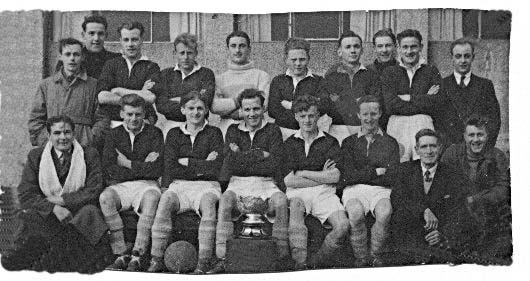 In this photo of the Crosshill Amateurs from the early 1950's Harry is immediately to the left of the trophy holder. Harry was born in Maybole and lived with his extended family in Allans Hill and enjoyed all the local activities. He attended Cairn Primary School and then Carrick Academy until 1950. Harry was academically bright but did not pursue an academic career leaving school to work for a short period in Lees’s factory before working on the Railway at Minishant prior to joining the RAF as a regular. Harry spent a relatively short time in Maybole but was always proud of his Maybole roots. During his formative years he was an accomplished billiard player, a talented footballer, playing for local teams including Maybole Juniors and was a stalwart of the local ‘go as you please scene’ with a fine voice and a talent for playing various ‘improvised percussion’ instruments (spoons and bones in old money). His period in the RAF was served with distinction and in addition to his Air Force duties his football talent was recognised resulting in him playing for several professional teams as an Amateur, depending on his particular posting, On leaving the RAF he became a professional golfer and then developed a career in education following reinstatement as an Amateur golfer. As an amateur he was a member of Hayling Island Golf Club, near Portsmouth, for some 30 years and served the club with distinction including achieving the honour of being Club Champion. During his time at Hayling Island he met and married Jean and they had a long and happy marriage with a wide circle of friends. They were both regular visitors to Maybole over the years meeting many acquaintances including his old friend Jack Boyd. Harry had a very pawky sense of humour with a love of life but above all he had a deep feeling and consideration for his fellow man and for this above all he will be remembered with much affection.